You see them all over in the home decor world now! FLOWERS! And not just any flowers, but flowers that are hand painted. Flowers that look amazing by all these sign makers and stylists and you wonder how you can create your own. Well, I’m gonna tell you a secret! They aren’t hard! 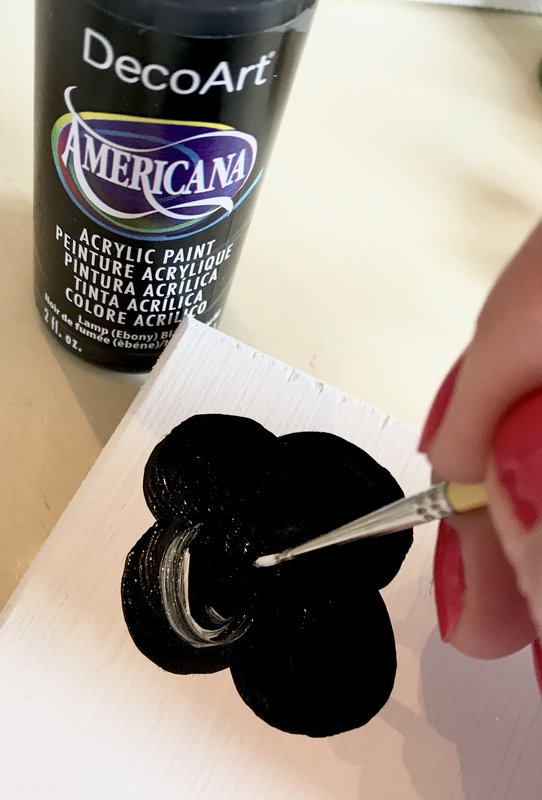 And I’m going to show you how to make them, It doesn’t matter if you’re a beginner or you’ve been painting for years, these flowers are adorable and EASY! 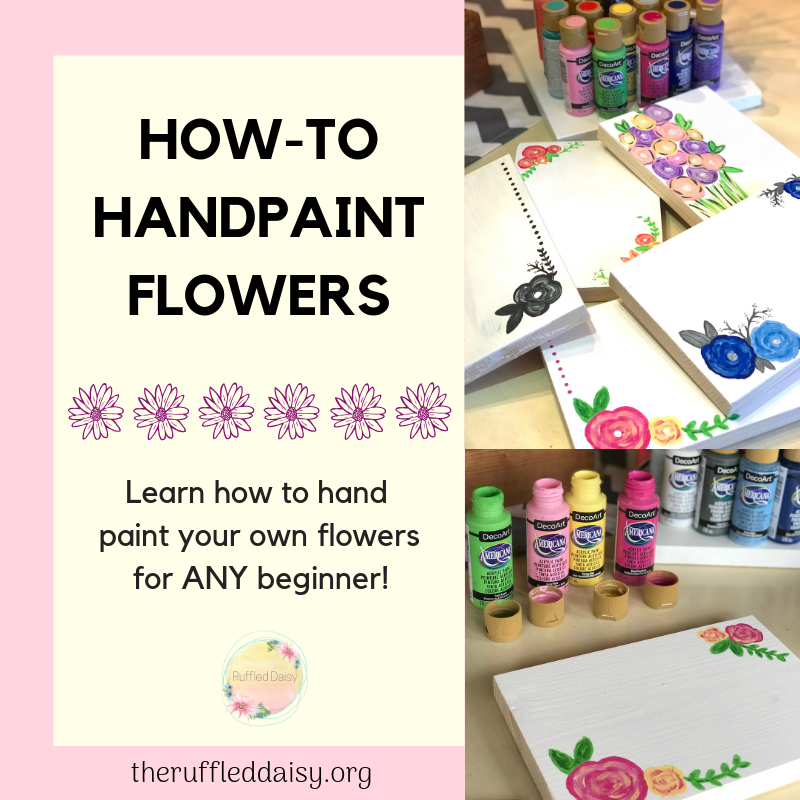 Find out how to make your own hand painted flower! 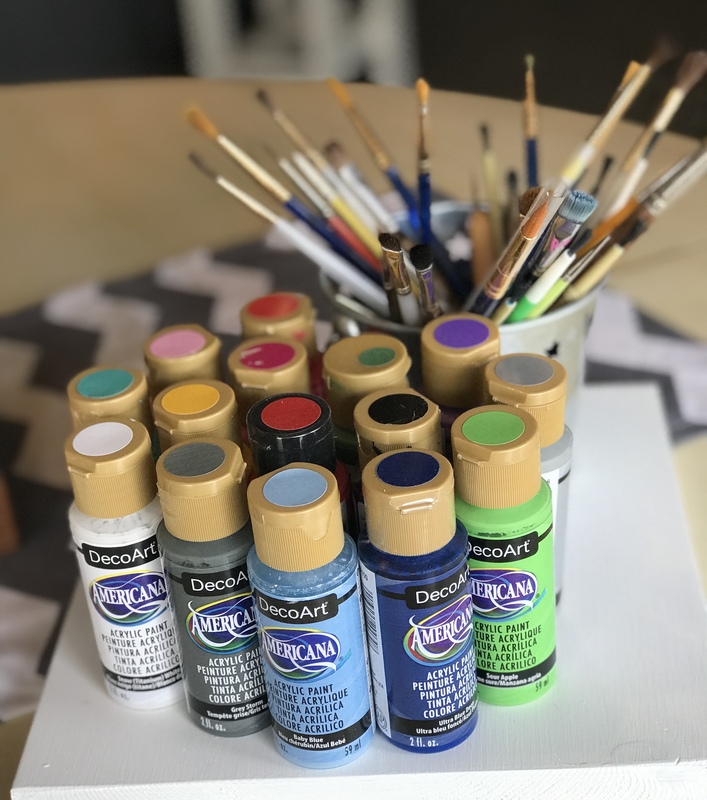 I am a HUGE fan of the DecoArt paint. They have ALL kinds of paint – meaning paint for glass, furniture, wood, metal, fabric, indoor, outdoor, you name it. 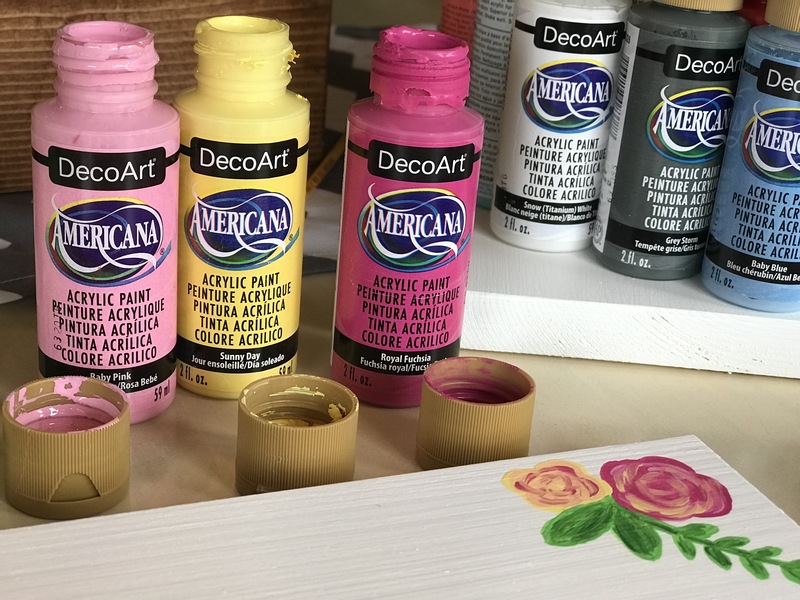 If you want to paint it, then DecoArt has a paint that is perfect! 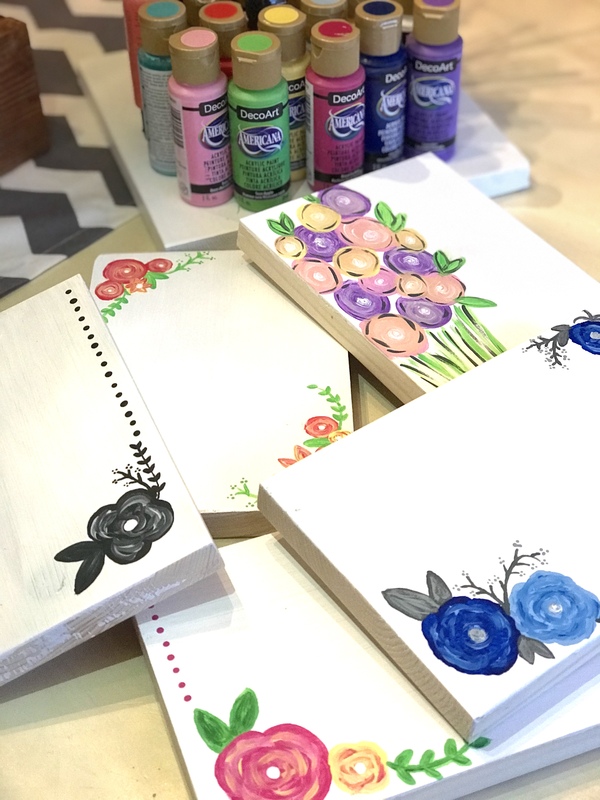 To try your hand at painting flowers, grab some acrylic paint and a scrap piece of wood or canvas board. Really whatever you have will work. We’re just practicing here. Decide on your color combinations. I LOVE this trio (baby pink, sunny day, and royal fuchsia) of colors for flowers! You can see the finished flower in this pic. Your’s is gonna look just like that! 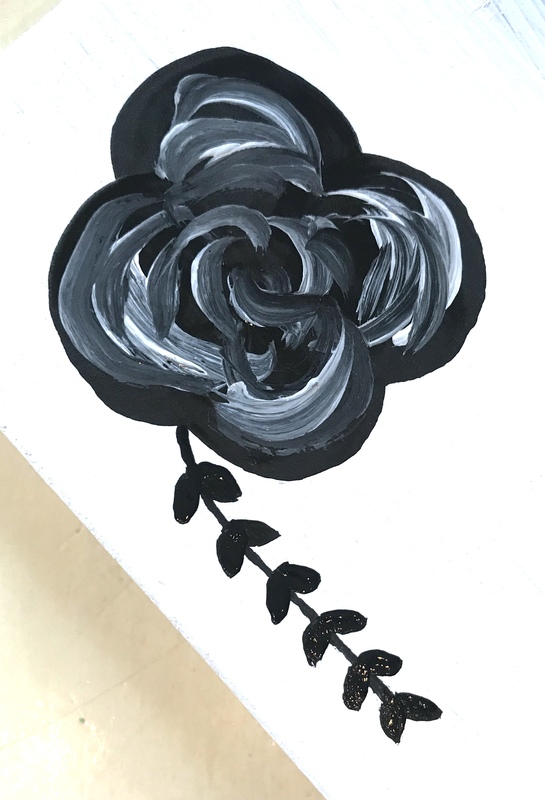 For the sample pics, I am going to create some black and white flowers! They make such an impact when used as flowers! Using a small brush, paint four circles on top of each other. While your first color is still slightly wet, use your contracting color to add depth. You are simply going to paint curved lines that follow the lines of the circles. 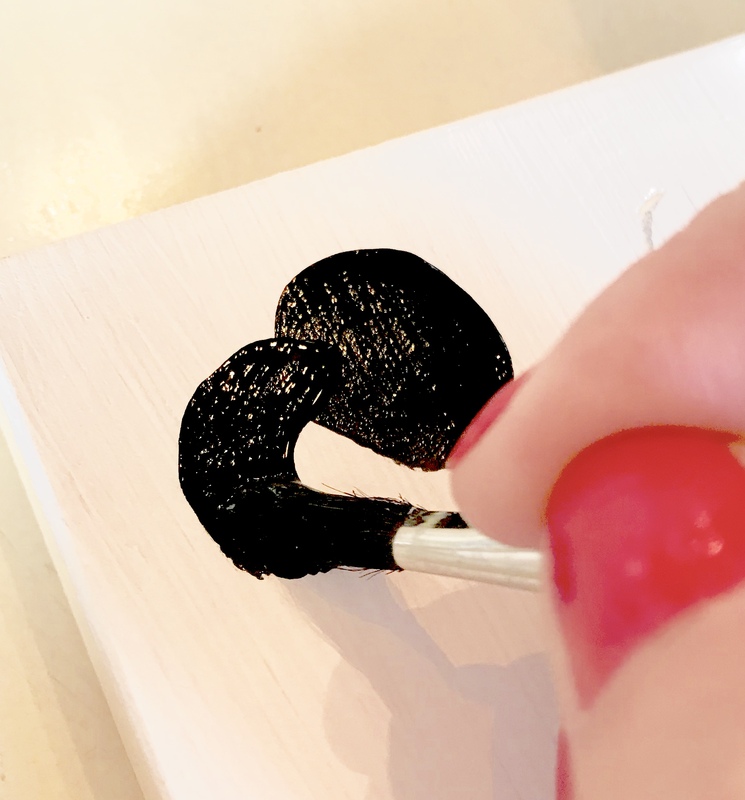 Doing this while your first color is still wet will make it blend nicely. Now it’s time to add some details. I added some dots and some leaves and here’s how you can do that. 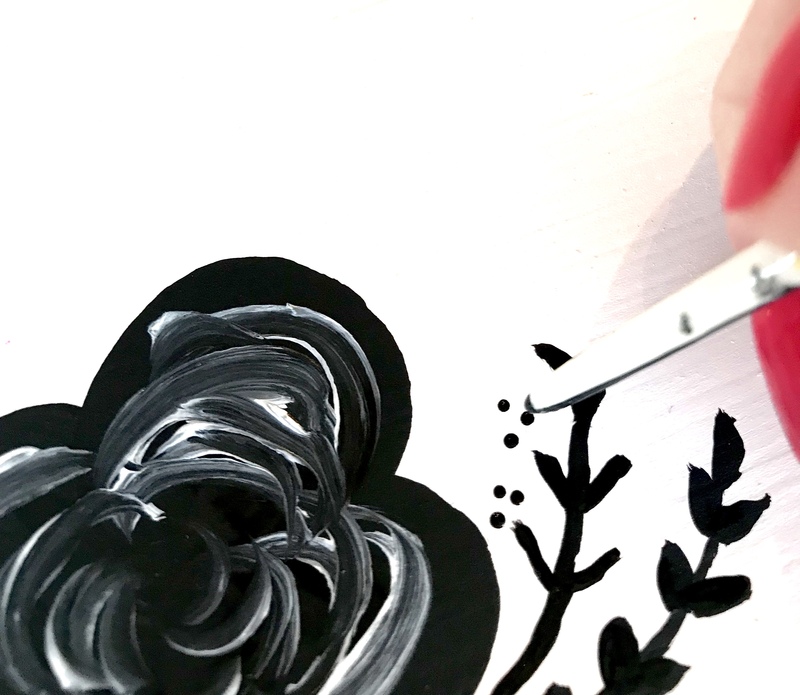 Simply add some “shoots” off of the flower with some curved lines. Then you can add some leaves. You’re basically going to be painting a “V” on the stems. 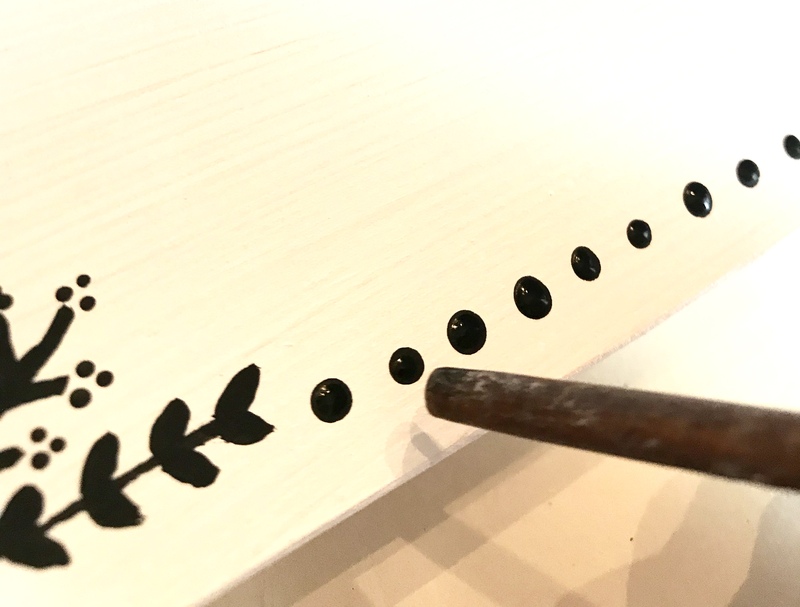 Using the handle of my brush, I dipped it in paint to make some dots along the side of my board. They make PERFECT circles! Make sure you add a white dot to the center of the flower to complete it. 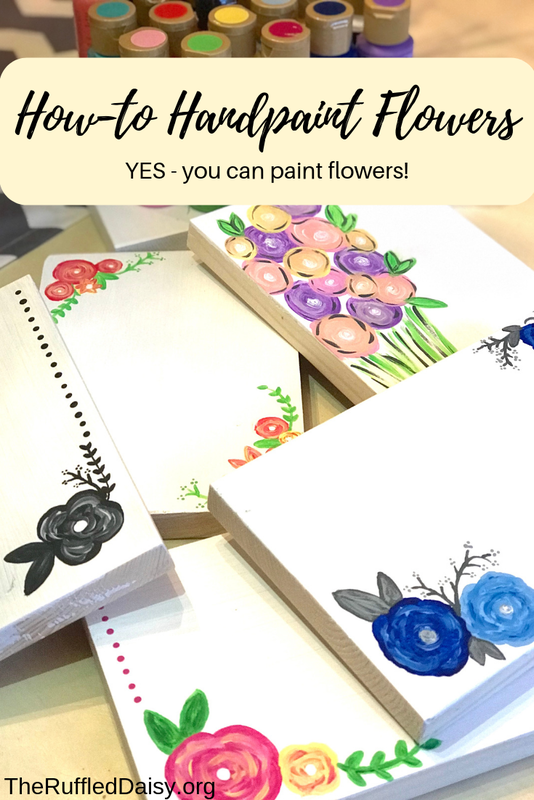 Now you have some nicely painted flowers that took less than 5 minutes to create!!! You can layer these and have multiple flowers on one piece. 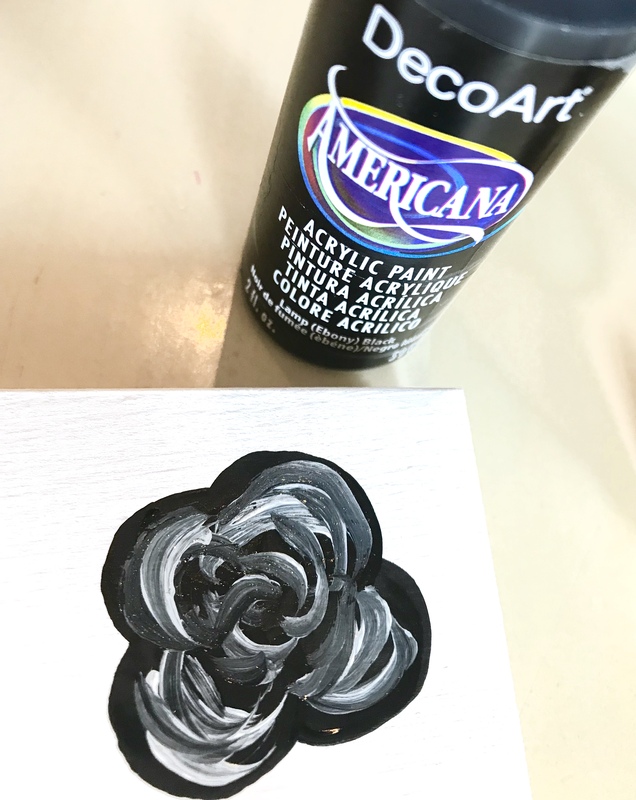 Just make sure that your paint is completely dry before starting your next flower. As you can see, the possibilities are endless with these cuties! These can be used to make cards or signs of your own! I added some quotes to these boards for my shop and let me tell you, they didn’t last! People LOVE small signs with cute touches like this. I told you it was EASY! !